12 page atlas that provides a simple introduction to the globe and places around the world, with special focus on Wales, Scotland, France, Spain & Italy. a CD including the information on the cards and the pages from the atlas (PDF). 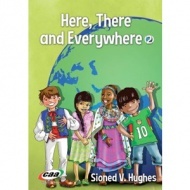 Here, There and Everywhere (1) is suitable for children aged 3 -5. Published in Wales, the resources make reference to comparing the different countries featured with Wales and also comparing with Welsh language / culture, but these examples can easily be changed to your home country / language. All of the resources are in English (a Welsh language edition is available separately).